You can conveniently transfer funds online through the Banco de Oro Internet banking option. Here is how it can be done. Registration must be verified through a BDO ATM teller machine in order to complete the online registraton process. The instructions for verification will be sent to your selected mobile number or email. Once you are able to access your account online, you need to add the other party's account in order to start sending money. Unfortunately, the function is limited to BDO accounts only at the moment. You can still send money to non-BDO accounts but a 100 pesos charge will be debited and funds are credited to the other bank after 1-3 business days. 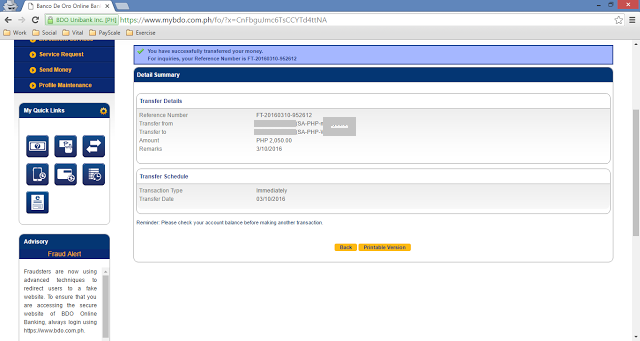 Logon to your BDO online account. Like registration, this feature has to be activated through any BDO ATM using the BDO debit card associated to the account within the allowed period (45 days). Otherwise, the process will not go through. With that taken care of, the actual process of transferring will be easy. Click the Transfer Money icon. 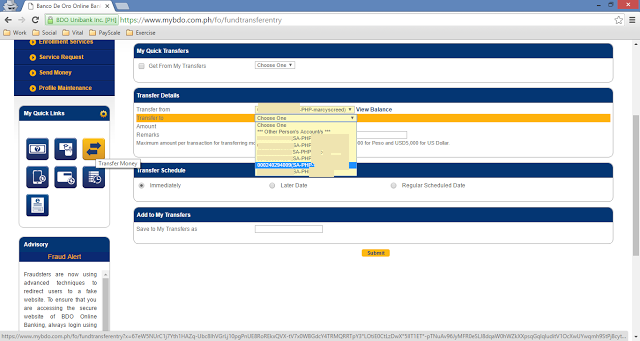 From the drop down options, choose which account to get the funds from and which account to send money to. Enter the amount and remarks. See image below. 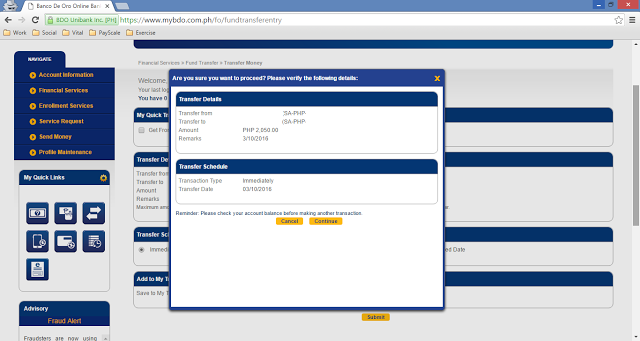 Lastly, the confirmation message after a successful transaction.